The enormous amount of information available on the Internet requires the use of search engines in order to find specific information. 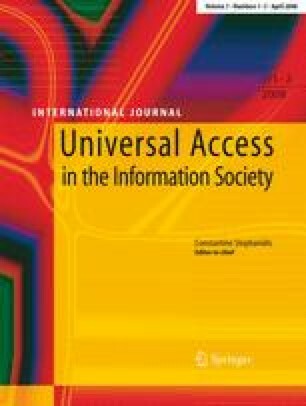 As far as web accessibility is concerned, search engines contain two kinds of barriers: on the one hand, the interfaces for making queries and accessing results are not always accessible; on the other hand, web accessibility is not taken into account in information retrieval (IR) processes. Consequently, in addition to interface problems, accessing the items in the list of results tends to be an unsatisfactory experience for people with disabilities. Some groups of users cannot take advantage of the services provided by search engines, as the results are not useful due to their accessibility restrictions. The goal of this paper is to propose the integration of web accessibility measurement into information retrieval processes. Firstly, quantitative accessibility metrics are defined in order to accurately measure the accessibility level of web pages. Secondly, a model to integrate these metrics within IR processes is proposed. Finally, a prototype search engine which re-ranks results according to their accessibility level based on the proposed model is described. Markel Vigo’s work is funded by the Department of Education, Universities and Research of Basque Government. The Council of Gipuzkoa has also supported this research.